Do you still buy products and services or have you embraced the Sharing Economy? In future, marketing executives may well pose this kind of question to their customers more often. The Sharing Economy, that is the sharing and exchanging of property, resources and services, is becoming increasingly well-known. You can read about this in the Focustopic entitled “Sharing: a current trend?”. Many companies also believe that this model of joint consumption has become a trend which will assume an increasingly prominent role within the economy. But what does this mean for their own sales potential? Do sharing platforms represent a threat to some industries? The majority of company representatives surveyed do not believe so. 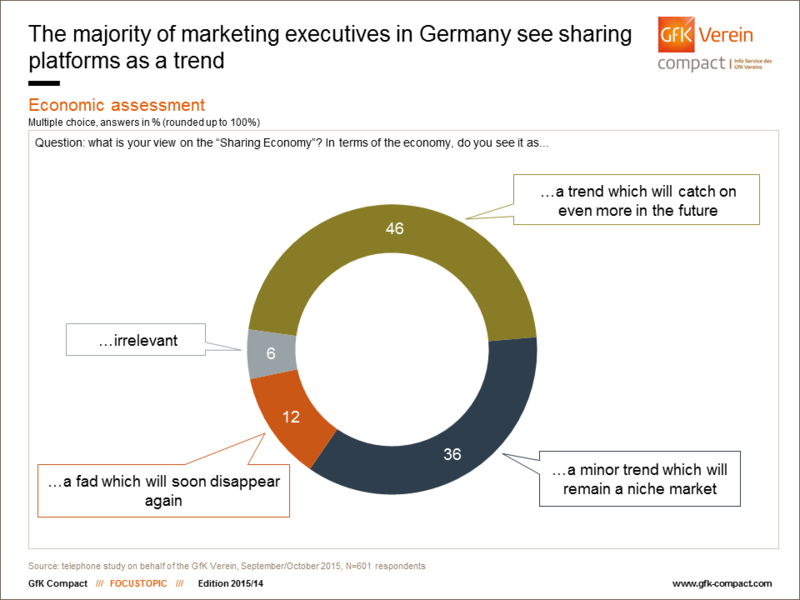 Almost one in two marketing executives in Germany believes that sharing platforms will assume greater economic importance. A total of 46% of respondents believe that this form of consumption will become increasingly relevant for the economy in future. However, 36% of respondents are of the view that the Sharing Economy is a trend which is only popular among certain consumer groups – a sort of niche phenomenon. And around one in ten (12%) think that the Sharing Economy is just a fad, destined to disappear from public consciousness in due course. This has been revealed by findings of the “Marketing concerns” study, for which GfK Verein surveyed approximately 600 marketing executives at German companies this autumn. The following industries and sectors were included in the survey: manufacturing/processing, energy/water/transport, construction, trade (including automotive), catering and hospitality, banking/insurance/real estate, health and social care as well as professional and other services. The survey findings differ according to industry. Representatives of the catering and hospitality industry, the energy/water/transport sector as well as the banking, insurance and real estate industries believe more strongly that the Sharing Economy is a development which will be increasingly relevant for the economy as a whole in the years to come. The proportion of marketing executives who share this view ranges from 56% (for catering and hospitality) to 54% (for the banking/insurance/real estate industry). Furthermore, more than one in two (51%) respondents involved in the healthcare and other services sectors feel that the concept of sharing and exchanging will gain importance for the economy. Among professional service providers, such as corporate consultancy firms, telecommunications companies and architects, this figure is 49%. However, at 43%, marketing executives in the trade industry are slightly more skeptical than average, followed by their colleagues from the manufacturing and processing industries (42%). The construction industry contains the largest proportion of skeptics, with just 36% of respondents here opining that the Sharing Economy will become more important for Germany’s economy as a whole in the next few years. While some industry representatives may exercise a degree of caution in responding to this question, they stop short of writing off the future viability of sharing concepts in general. Often they just simply don’t believe that the Sharing Economy will be a trend which is relevant to everyone, although they can imagine how sharing platforms would appeal to individual sectors or consumer groups. In the construction industry, 46% of respondents are of the view that sharing and exchanging is something of a niche trend; 43% of trade representatives surveyed share this view, while the figure for the banking, insurance and real estate industries is 39%. The value is lowest among marketing executives in the energy sector: Just one in five is of the view that sharing platforms will become more important for certain sectors. Conversely, the number of those who believe that Sharing Economy is nothing more than a passing trend which will soon disappear from the scene remains under the 20% mark across all industries. This new form of consumption has been a subject of some controversy for the public, irrespective of whether the Sharing Economy is a niche market or a development with mass appeal. While some consumers believe it presents opportunities to preserve natural resources, save some money and get to know new people, some companies are more preoccupied with the potential competitive disadvantages the Sharing Economy could throw up. In this regard, taxi firms in many places are on the warpath against the U.S. start-up “Uber” which enables transport services to be booked online in many cities around the world. In Germany, the courts have ruled against parts of Uber’s services. However, some companies are also trying to exploit the Sharing Economy in that they themselves become a part of the sharing community. By way of example, the carmaker BMW and car hire company Sixt launched the “Drive now!” initiative together a few years ago. This is a car sharing platform available not only in various German cities but now also in the UK, Sweden, Austria and Switzerland. So, do marketing executives now view sharing platforms as a blessing or a curse for their respective industries? The majority of those surveyed in Germany said: neither. However, even more (71%) regard the Sharing Economy as something of an irrelevance. The remaining respondents were pretty positive: One in five can still identify opportunities linked to the Sharing Economy, while just 4% view it as a threat. 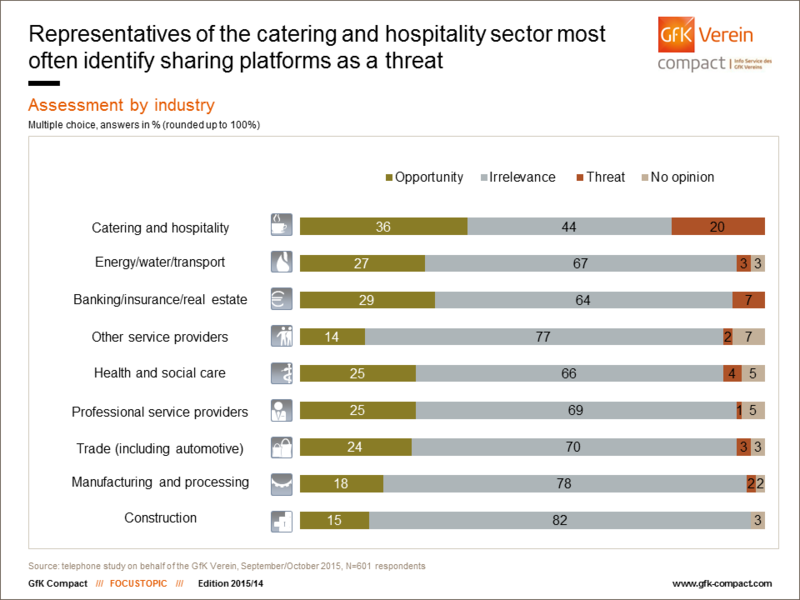 Representatives of the catering and hospitality industry most regularly express fears regarding sharing platforms. 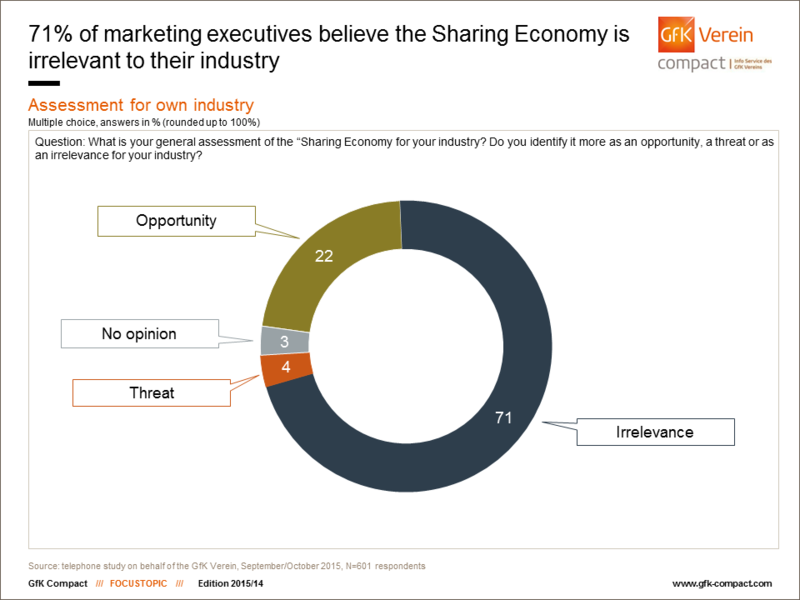 One in five marketing executives in this sector believes that the Sharing Economy may represent a threat to their industry. This is significantly more than in all other industries, where the corresponding values are single-figure percentages or - like in construction industries - where they hardly believe that there is a threat at all. This is perhaps because of the fact that within the catering and hospitality sector there are numerous platforms which offer alternatives to “classic” consumption. For example, if you want to go for a nice meal with some friends one evening, you could head to a restaurant. Or, you could register with “Cookasa”, an online platform established in Bremen with the aim of bringing together a group of strangers from various cities to prepare a meal for each other. Who hosts the meal and who buys the ingredients is decided by chance. Everyone cooks together – the founders call this “social cooking”. And for those who, after their fill of Thai curry, pasta or even hog roast, lack the energy for the long journey home, there is always the accommodation rental platform “Airbnb” to find somewhere to sleep for the night. So, are hoteliers, restaurateurs and bar owners particularly critical of this new form of consumption? Well yes... and no. 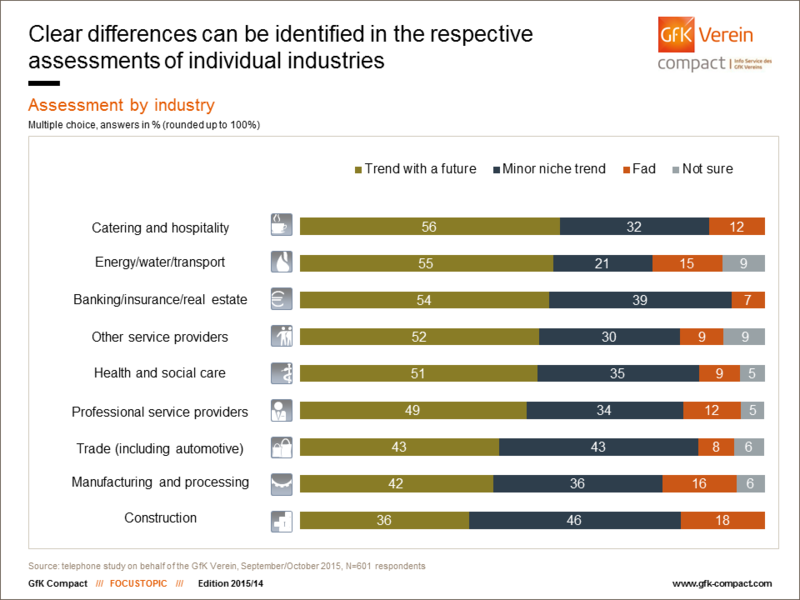 On the one hand, marketing executives in the hospitality and catering sector believe their industry faces the most significant “potential threat”, but on the other, the industry also contains the largest proportion of respondents who identify opportunities in the Sharing Economy to be exploited. A total of 36% believe that sharing platforms could be of benefit to their own industry, followed by respondents from the financial and real estate sectors (29%) in addition to energy, water and transport industries (27%). Around one in four respondents from the health and social sectors as well as those from the services industry also see potential advantages in sharing business models. However, respondents in the trade, manufacturing, processing and construction industries are more skeptical about any potential opportunities. The value for these industries is under the 20% mark. Nevertheless, the construction industry does actually make use of sharing platforms. Zeppelin Baumaschinen GmbH, headquartered in Garching bei München, Germany, supplies used excavators, dozers and loaders. Those looking for a specific machine simply need to take a look at the company’s website and may well find exactly what they need in a matter of clicks. Caterpillar and Komatsu, the heavy-duty agricultural and construction machinery manufacturers, also offer used machines. A year ago, Nils-Viktor Sorge wrote about this in Manager Magazine . Moreover, they use regional platforms to bring together interested parties and sellers of used machinery and replacement parts. In doing so, they have been playing their part in success of the Sharing Economy for a long time.